Wholly heart-thumping and exciting. The Hunger Games is the most popular recent literary dystopia of a future world where teens are selected for games to the death. The film has already been anticipated for over a year now of becoming a worldwide pop culture phenomenon. But you’re really missing out if you miss the literary experience of Suzanne Collins’ magnum opus. The greatest misconception is that the books are strictly YA (Young Adult) literature, which is hogwash. This is adult reading material that is potent enough to recall the best of George Orwell or Margaret Atwood. The movie itself, directed by Gary Ross (“Seabiscuit”), is respectful of the source material and yet shaped in a slightly negligible way to patronize the tween audience. But you can’t deny the film’s primal ferocity. Many performances are duly vulnerable and yet amazingly tenacious, including the two most important ones: Jennifer Lawrence (“Winter’s Bone”) in the lead role as Katniss Everdeen and Josh Hutcherson (“The Kids are All Right”) as Peeta Mellark. Katniss and Peeta are the two teens selected for the annual games where 24 children are plucked, two from each district, and thrown into a bloodlust arena that lasts at least a few days. 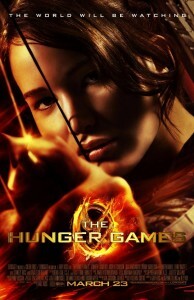 Katniss, from District 12, has volunteered in place of her sister who is too feeble to have a chance. The self-effacing Peeta has decided that in the arena, his fellow lady comes first. Essential too is Donald Sutherland (“Space Cowboys,” “Panic”) who is marvelously imperious as President Snow of Panem whom has an intellectual understanding of his own power. He understands the whole “bread and circuses” dynamic, and he knows that you control a mass of people by off-setting fear with hope. Not too much hope, for a dictatorship must be able to convince the masses that they can be quashed if there was the slightest sign of revolt. Malcolm McDowell (“A Clockwork Orange,” “Star Trek: Generations”) might have been an interesting casting choice as Snow, but he might have played him too much of a scenery-chewing madman without a grasp for the glib pomposity that Sutherland exudes. Some of the best scenes take place prior to the “games,” and live up to the book. The chariot entrance preceding the opening ceremonies has a colorfully garish madness to it. 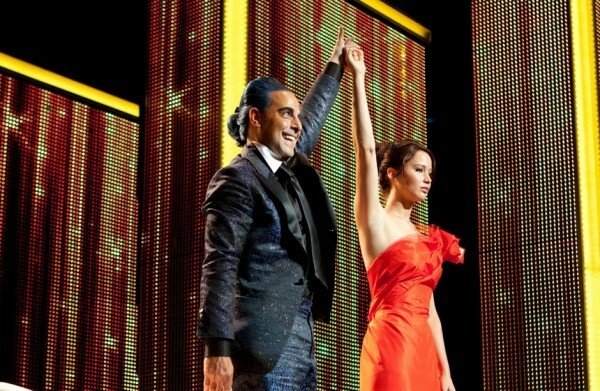 Stanley Tucci is pitch-perfect as the purple-haired interviewer Caesar Flickerman. 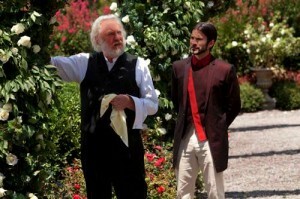 Behind the scenes is Wes Bentley as the gamesmaker Seneca Crane who has further shades of character, both arrogant and under pressure to tweak anything in the games that could satisfy the world’s spectators. During the scenes, I noticed how rarely costumes and architectural design has so invaluably enhanced a film. When it comes to the film editing it is both professionally polished and hasty, I fear. With a running time of 142 minutes, there certainly must have been studio pressure to deliver a final cut that serves future commercial sales. But I wish extra minutes had been spent on various aspects that are glossed over: the description of exports goods of each district, adequate enough time spent on the opponent tributes, the introduction and portrayals of the sponsors during the games, the trepidation for love and attachment for Katniss, and most glaringly, a satisfying amount of time to develop Gale Hawthorne (Liam Hemsworth) who as an integral character gets gypped. He’s more a plot device than a full-rounded character. Of all the performances that I had high expectations for, I felt a little letdown – in the face of high expectations – for Woody Harrelson as games mentor Haymitch. You can go on and on about brilliant casting choices, but Harrelson (currently in theaters as a sociopath cop in “Rampart”) was one of the best coups for director Gary Ross. Haymitch, weathered by the cruel nature of seeing for years his district pupils exterminated in the games, has turned to not just the bottle, but into a narcissistic wash-out in the book. This is in the movie, but Haymitch sadly, is just not drunk enough. His transition to become a faithful pledge for Katniss is all the more obligatory. On the other hand Elizabeth Banks, as the chaperon Effie Trinket, is aptly bizarre. Oddly, I love this “Hunger Games” movie and at the same time had yearnings for it to expunge the book’s greater complexities. It’s Orwell-lite with a heroine who is persevering if a little too wise by Jennifer Lawrence. That’s not to say that this young actress isn’t great. In the face of mortality and life-and-death choices, her Katniss makes courageous choices we only wish we’d make if we were in her shoes. 142 minutes worth isn’t the end. We have “Catching Fire” and “Mockingjay” ahead of us, and the hope that Gale gets more meaningful treatment in the next installment. And the hope that we can grittier glimpses into the melancholia of a conflicted heroine who is a teen but must be the influential adult leader of a district and of a nation. Film Cousins: “Logan’s Run” (1976); “1984” (1984); “The Running Man” (1987); “Battle Royale” (2001, Japan).